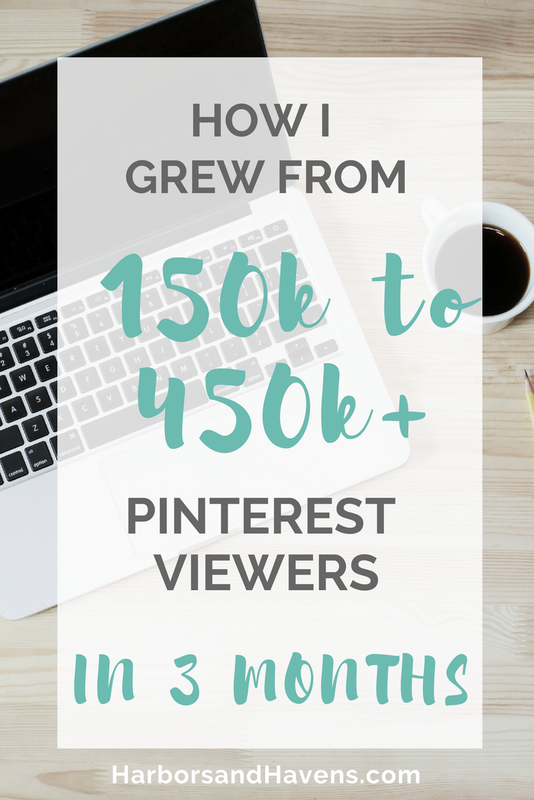 In my last Pinterest tutorial, I explained the steps I took to grow my Pinterest from fewer than 9k viewers to 150k in four weeks. In this update, I'll share how I exploded that growth to nearly half a million viewers in just a couple of months. After a huge month in February of focusing on Pinterest and catapulting my growth, my account peaked at about 200k monthly viewers in March and then dropped a little and went stagnant through spring, despite putting consistent effort into it. Come summer, I decided I needed to make a change. I was spending a lot of time working on the platform but not seeing any growth or a significant rise in traffic to my blog through Pinterest. I needed to figure out a way to see bigger results with less effort. And that’s exactly what happened! My viewers increased from a steady 150k through the end of May to 450k (and growing) in August. So what did I do? Keep reading for all the changes I made and how I plan to grow next. If you’re just starting out on Pinterest, read this post for the first steps you should take. The biggest thing that changed in the past few months is that I finally buckled down and purchased tailwind in June. I think what finally made me decide to do it was hearing an interview with a Pinterest rep where she talked about consistency being important in the algorithm. When I was pinning only by hand, I had to do it in large chunks here and there, so my pinning habits looked something like this: Save 55 pins Monday morning and 45 pins Monday night, ignore the app for a day, save 95 pins between 8-10 p.m. on Wednesday. You get the picture. Now, I can still work with batches of pins like I was doing, but instead of live pinning them, I add them to my Tailwind schedule and they go out automatically at consistent, preset times. The Tailwind planner shows me which times are ideal for my pins, so I can set my schedule accordingly. This is also very useful when I'm traveling for a couple of weeks at a time, so I can still be “pinning” even when I'm busy. Growth plan: The past few weeks, I’ve actually started cutting back on the number of pins in my scheduled. With all the Pinterest share threads I had been doing, I had to put 100-plus spots in my schedule each day to fit all the pins. Most Pinterest experts say they only pin around 50 a day, so I’ve been working on cutting mine back to that number. I’m now at 50 pins a day and plan on leaving it there for the next month to see what happens with my Pinterest viewers and blog traffic. The ultimate goal is blog traffic, so if my Pinterest views take a hit but my pins get more exposure and views, that will be a win. Joining Tailwind has also made it a million times easier to share my content consistently across the group boards I'm on. Previously, I would just share to group boards when I thought about it, which made it impossible to keep up with where and when I had already shared a pin. Next, I attempted using an excel sheet to track it all, but that quickly grew huge and overwhelming. With Tailwind, I can schedule a pin to multiple boards at once (both mine and group ones) and set it to go out at intervals so it's pinning every few days at different hours instead of a bunch of times in a row. This means every pin I create is getting maximum visibility and lots of chances to pick up steam. Growth plan: Right now, I share my content indiscriminately across all the group boards I’m a member of, but I need to do an evaluation of which ones are the most beneficial and use those more. I might also need to leave a couple if they aren’t getting me any repins and find some new ones to join. Another benefit I owe solely to Tailwind — the ability to join “Tribes.” These are groups of pinners in the same niche who share their content onto an invitation-only feed on Tailwind. There are typically rules like you must share a pin from the feed for each one that you add, but unlike pin threads, you can choose which pins you want to share and ignore the ones you don’t. The Tribe pins are also handy for filling your schedule when you’re short on content. Growth plan: I’m currently only in two Tailwind Tribes, so I’m not using this feature to its full capability. I need to find a few more to join and remember to use them more often (right now I’m only sharing 20-30 pins a month in Tribes and you can share up to 80 with the membership level I have). Pin threads on Facebook are a great way to get your pins circulating, but they are also quite time-consuming. At my peak, I was participating in 10-plus a week. I’ve now cut that in half, which combined with using Tailwind has saved me significant time. Cutting back hasn’t had any significant effect on my Pinterest viewers or blog traffic either. Sometimes you have to prune the plant to help it thrive. Growth plan: I’m satisfied with my current participation level on pin threads and it’s at a manageable level for now. At some point, if I hire a virtual assistant to help with online tasks, I will probably hand this one over. Hashtags on Pinterest are still a bit of a mystery. I’m not sure who uses them to search, but I’m working under the assumption that they are being used and adding hashtags to all of my pin descriptions now. You can add up to 20, but I typically keep to around 10 since they are included in the max number of characters you can use in your descriptions. I’m not sure whether the hashtags are actually giving my pins any more exposure, but since my account has seen significant growth since I began using them, they are worth mentioning. Growth plan: I need to do more research about best practices for hashtags and which ones will get me the most traction and exposure. I typically make 4 to 8 pins for each article on my blog, but previously I was only uploading a couple onto the article itself. For the others, I would use the “create a pin” button on Pinterest, upload the image, and attach the link. After a while, though, I started noticing that the images I pinned directly from my blog were getting more views and pins than the ones I had uploaded manually. So, the past couple of months I have been adding all my pin images onto each blog post and pinning them from there. I also periodically click through my blog and pin images from older posts to try to get those circulating again. Growth plan: Pinning from my site is a somewhat irregular endeavor. I need to make it more of a habit to keep up the traction. I mentioned in my last Pinterest tutorial that I planned to start creating more consistent branding across my pins. Previously, I was creating a different looking pin each time with colors and fonts that complimented the photo. Now, I use the same two fonts, colors and general layout for each pin I make. Not only does this create a consistent look for my pins, but it also makes preparing pins a lot faster, since I can just plug new images into my format, change the words and be done! Growth plan: My current pin look feels a little “blah,” so I need to work on my branding and design to come up with a recognizable and attractive pin format. 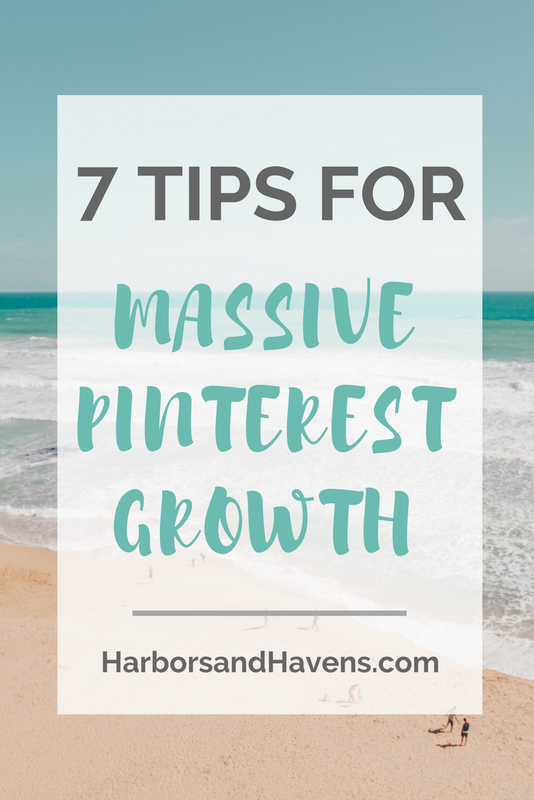 Do you have a question about Pinterest growth? Drop it in the comments and I’ll try to help!